Hydrangea paniculata, commonly called Pee-Gee or Tree Hydrangea, so named for the conical arrangement of the inflorescence called a panicle. This hydrangea blooms on new wood and the particular "tree" this bloom was on has been an interesting experiment in pruning for me. I let it go for a little while and the weight of the blooms on the bottom branches caused them to droop all the way to the ground and root themselves, so this tree has two 'children' which I seperated and are doing quite well. Because this is one of the favorites in my garden, a leisurely sketch was a pleasure to do. 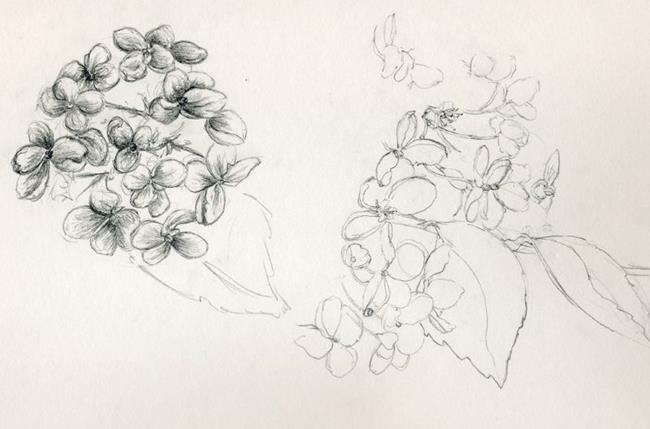 I felt it needed a 'nothing fancy' approach and just worked in some contour sketches with regular HB pencil on cream colored drawing paper to show my straightforward appreciation of this plant.